This is one of our free cross stitch patterns named Baby Capricorn, part of our Baby Zodiac Series and a pattern that would be great for your baby or personal cross stitch project or as a unique birthday stitching pattern for friends and family. 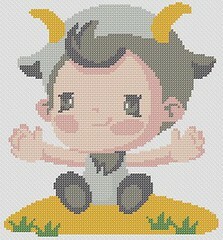 Download Baby Capricorn Cross Stitch Pattern zipped file (approx. 520kb — downloaded 187 times). The password for this download is “crossstitch4free” without the quotation marks. We have many more themed and free cross stitch patterns for zodiacs, cartoons, alphabets, wedding, special occasions, and many more. Click on the list of word in the Related Keywords at the bottom of this page, visit our recommended cross stitch templates, or peruse our whole collection of cross stitch patterns using the navigation menu above this site. Remember to subscribe to our web site update via e-mail (on the main page) or via RSS feed (link can be found at the bottom of this page). Also, feel free to link directly to this page if you would like to share our cross stich patterns with your friends and family through your blog or favourite arts and crafts forum.